On one of the coldest autumn days on record, I was part of the one of the warmest weddings ever! Last weekend Dawn and Mike braved the cold with their bridal party to capture quintessential Philadelphia photos for their fairytale wedding. Not only did they shoot in front of City Hall, a must with Philadelphia brides, they launched doves to symbolize their new life together! They also arrived at Ballroom at the Ben in a horse and carriage fit for a princess! The couple’s love for each other was felt by everyone and the beautiful surroundings captured their love and sweet personalities. I knew this wedding was going to be extra special from the moment the bride contacted me. We hit if off right away and I enjoyed working with her directly as we designed a custom silk floral wall and table runner for the sweetheart table. Dawn inspired me to start my new Luxury Collection which includes embellishments like gemstones, crystals and pearls. And, it was a pleasure to work with so many top-notch professionals in the area. Marcus Hook Florist and Beautiful Blooms made coordinating my silk florals seamless. 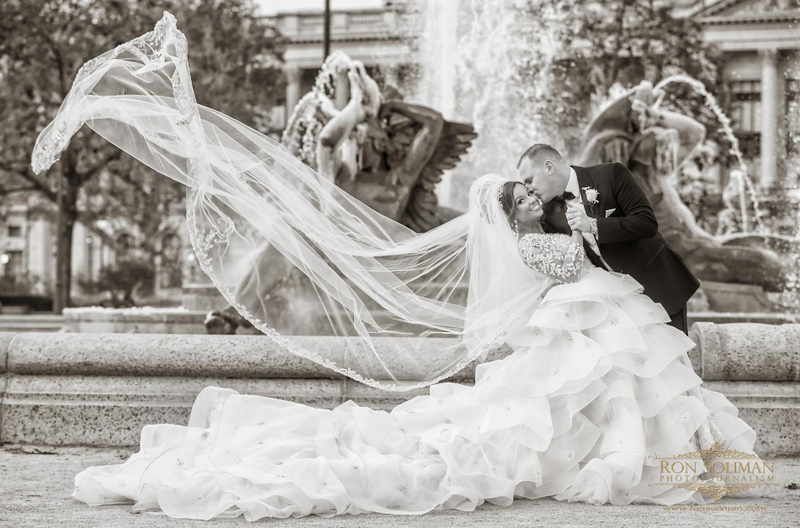 Dawn’s stunning princess-like gown is from Van Cleve Bridal. Of course, I don’t work directly with them, but they certainly play an important role in turning the special day into a fairytale story. I can’t say enough about the outstanding photography of Ron Soliman. Ron’s use of light captured the beauty of my silk florals, but, more importantly, his photo journalistic talent told the story of two sweet people as they start a magical lifetime of happiness together. Lastly, I want to give a special shout out to Finley Caterers. I work with them on a regular basis at many of their venues including The Ben and Ellis Preserve. I love working with them because they make my job fun!